Is this the end of the Google gravy train? Google has announced that it is moving away from its business model of ad-supported services to start selling digital e-books online. At the annual BookExpo convention in New York this weekend, Google unveiled a service that would allows publishers to sell their book direct to readers, according to reports in the New York Times. Unlike Amazon, which discounts books heavily to Kindle owners (possibly even taking a loss on each bestseller sold), Google will allow publishers to set their own prices. 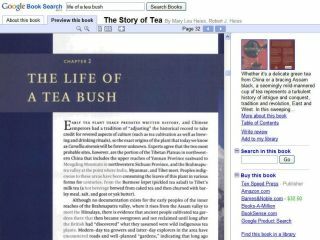 Google already has over a million and a half out of copyright books available to view online (and on Sony's Reader device), with another six million available for limited views and previews. Google is in ongoing talks with publishers - and the subject of a US Department of Justice investigation - about its programme of scanning books from university libraries, with the ultimate aim of offering every book ever published online. The agreements discussed this weekend are separate to that, and relate to new and catalogue titles that Google hopes to have available for sale by the end of this year. While Google has grown rapidly on its model of providing 'something for nothing' digital services, it has charged for video content in the past and is rumoured to be considering charging for premium content on YouTube. It also said that it would reserve the right to alter book prices that it considered 'exorbitant'.